This is a complete Weather Unit! This Unit is low prep and includes so many skills! Learning about Community Helpers and their roles is an essential skill for any student! 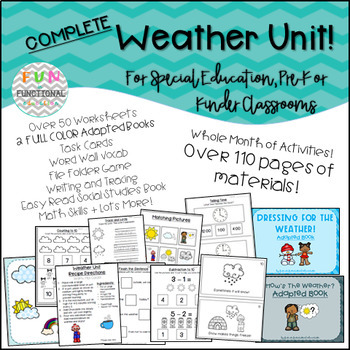 This Unit was designed for Special Education Classes but can be used in Resource Rooms, Pre-School or Kindergarten, or other Early Learner programs! 3 Adapted Books focusing on Community Helpers, their jobs, and their tools! 1 Easy Read book with Comprehension Questions! 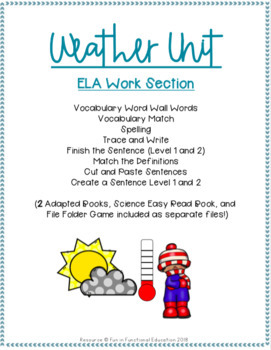 Most worksheets and easy read book are in black and white for reproducing quick and easy and save money on INK. 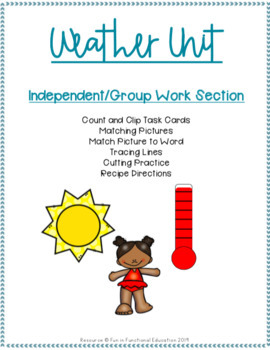 OR laminate and create icons to make an independent task version for students who need icons! The Adapted Books, Matching, and Word Wall Words are in bright color and perfect for Laminating and keeping for years to come! 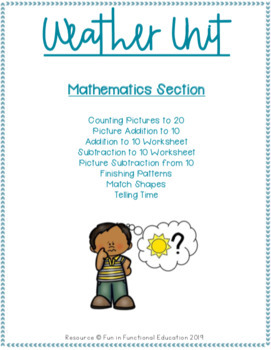 Some worksheets and projects come in a high or low level or are easy to adapt. Manipulative options are perfect for students with lower motor function or range, visual impairments, etc! Check out my Blog at funfunctionaleducation.wordpress.com for an idea of how I will use this in my classroom! !